You can’t go wrong with a flavorful chicken and rice dish. Today, we’re headed to Brazilian for a traditional galinhada. Variety is the key word of Brazilian cuisine. Indeed, Brazil food is characterized by influences from India, Portugal and Africa. Smaller communities also contribute to the richness of Brazilian cuisine as is the case of the Japanese, the Italians, the Arabs, the Germans, the Spanish or Est-Europeans. This mix of cultures and backgrounds is reflected in the flavors and aromas of Brazilian gastronomy. In this vast territory, each region has developed its own specialties and each state offers cuisines that reflect the unique landscapes and climatic conditions. Fuits are quite important in the cuisine of Brazil. Indeed, the immense variety of fruits as well as fruit-based drinks or desserts are endless! Galinhada is the dish I chose to prepare today. 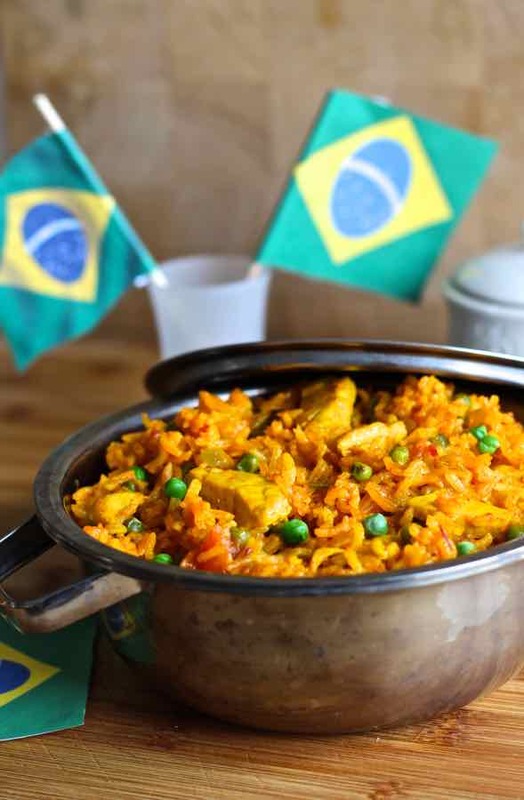 A recipe that originated in the states of Minas Gerais and Goiás, and that is prepared mainly with rice and chicken. The name comes from galinha, which is Portuguese for chicken. Finding the exact origin of galinhada is not an easy task. Its history is characterized by oral tradition. Its origin coincides with the arrival of the Portuguese in Brazil, in 1500. Chicken actually came with the Portuguese, who were those who took the first steps to develop an agricultural system in the country. Today, Brazil is one of the largest exporters and producers of chicken in the world. Chicken is one of the most consumed and abundant meat on the planet. Let’s talk about its history. Several sources show that Indians already had poultry farms as early as 5,000 years ago. The Chinese and Egyptians started 3500 years ago. Chicken was then introduced to Greece by the Persians. There are numerous races and varieties of chicken today. No less than 60 breeds and 175 varieties that all derive from the red junglefowl, native of Southeast Asia where it can still be found in the wild today. It is in the nineteenth century that mass production started, and in the 1920s that henhouse factories are first established, in the UK, then in the US. At that time, chickens were not farmed for their meat, but for their eggs. When they were no longer productive enough, they were slaughtered for their meat to be sold. By the 1950s, chickens farmed for their meat market largely outnumbered those farmed for their eggs. By the end of the twentieth century, chicken was the most consumed meat in the West, more than any other animal, including beef, which until then, was the most consumed meat. 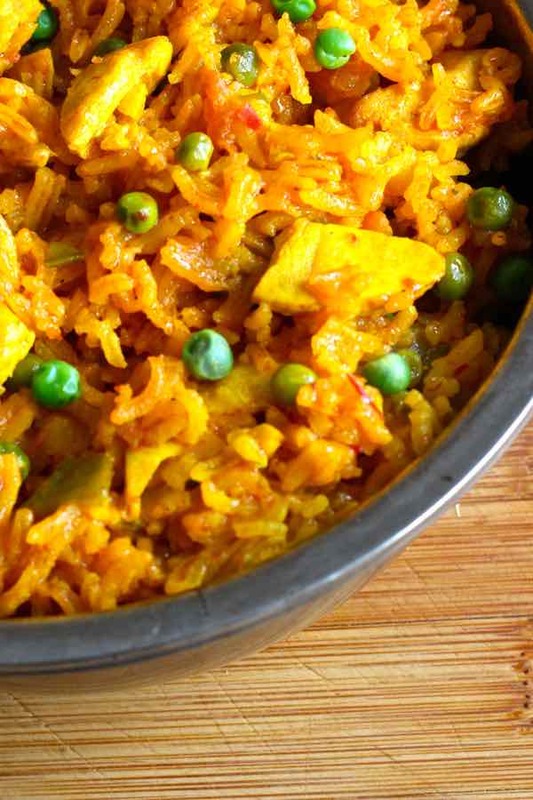 I chose to prepare galinhada in its most traditional form, namely with rice and chicken of course, but also with peas, green pepper and tomato, flavored with saffron, which is just as traditional as turmeric. Variants of this dish are also prepared with tutu feijão (beans), guariroba (variety of bitter palm of hearts) as well as pequi (Brazilian fruit). I must admit that I was very attracted to the recipe of one of the greatest chefs in the world, Alex Atala. The owner of restaurant D.O.M in Sāo Paulo, two Michelin stars and classified 4th best restaurant in the world has several very famous recipes but his most famous recipe is unquestionably that of galinhada. 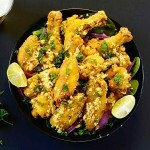 It is a recipe that he adapts in several ways and with different ingredients while using certain culinary techniques such as French and Italian, cuisines that he particularly likes. But the catch is that Atala’s most famous galinhada recipe is not entirely traditional. For example, he uses paprika and annatto instead of saffron or turmeric as he marinates the chicken for 48 hours while a lot of basil. Mixing rice and chicken or other proteins is a common practice in many countries. 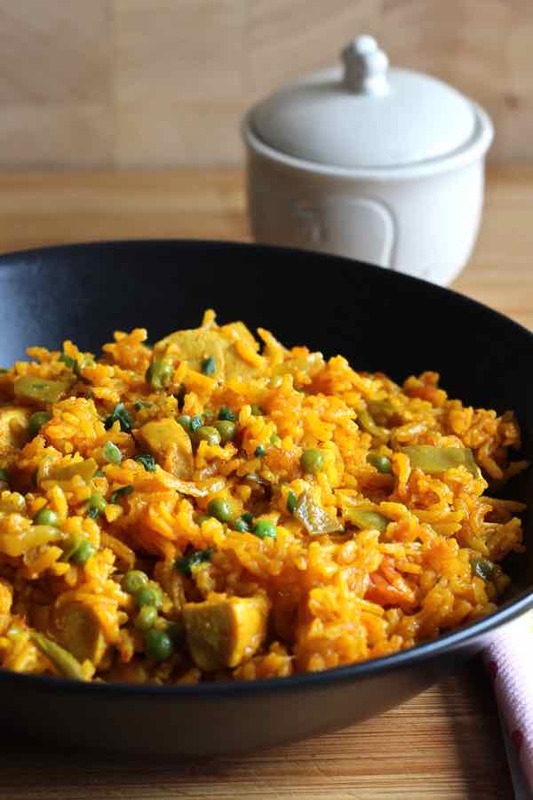 This recipe reminded me of the famous jollof rice from West Africa, arroz con pollo from Costa Rica or even chicken magbous from Oman. 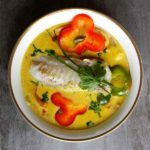 On the fish side, arroz con bacalao from Panama and cod blaff from Saint Vincent and the Grenadines are all similar recipes. And each country has its own history. 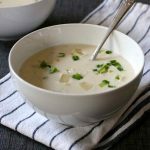 Galinhada is said to be the ultimate recipe to cure a hangover, similarly to chicken souse from the Bahamas. 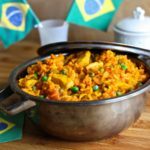 Galinhada is an emblematic Brazilian dish prepared with rice and chicken whose yellow color comes from saffron or turmeric. Mix the chicken, chicken bouillon, parsley, cilantro and lemon juice. Marinate for 2 hours. In a large pot, heat oil and brown the chicken pieces and the marinade for 3 minutes at high heat, stirring constantly. Add onion and garlic and cook for 5 minutes over high heat, stirring constantly. Add the rice, saffron, tomatoes, pepper, and peas. Mix well and cover with 3 cups of boiling water. Stir well and cook covered for 15 minutes over low/medium heat, stirring gently so that the rice does not stick to the bottom of the pot. Add a little boiling water during cooking if necessary. 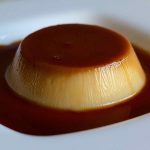 That’s so exciting to finally see a recipe for galinhada going around the web! 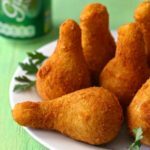 I’m from Minas and I grew up eating galinhada with a side of tutu de feijão. If I may suggest, at least in the very very interior of Minas we actually do not have saffron, or at least not the same type known by Americans and that come from flowers. Instead, our ‘açafrão da terra’ is the equivalent to turmeric. I’ve never had galinhada with tomatoes and pepers before but it does sound delicious! I’m used to using chopped carrots, corn, olives and chopped green onions & parsley! Obrigado Bianca, I checked into it, and it looks like açafrão da terra is really the same as turmeric. 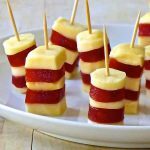 Tutu de feijão sounds delicious and quite easy to make. I will have to try next time! How much turmeric would you use to replace the saffron threads? Hey Faith, I would probably use 1/2 teaspoon to 1 teaspoon for this recipe. Had galinhada on my trip to Brazil 2 years ago. I made your recipe and it tasted exactly how I remembered it. Thanks! Do you cook the rice before adding it into the recipe, or does it cook once added? Also, would I need to change the cook times if I am using brown rice? Hey Daci. No, the rice is not cooked before it is added to the pot. It cooks together with the other ingredients. I would not recommend using the same recipe for brown rice, which requires way more time to cook. Enjoy! The green pepper, is that a jalapeño pepper or a bell pepper. Here in the USA, at least where I’m from, a green pepper is a bell pepper. Help!! Hey Vicki, sorry for the oversight. It is a green bell pepper indeed. Enjoy!